When I feel completely stuck in my life, I try to remember that I worked all this out about twenty years ago. If I walk, write, and make some art every day or nearly every day, then I can keep going and life can seem quite livable and sometimes even meaningful. So, when I run out of steam, I try walking, writing, or painting. 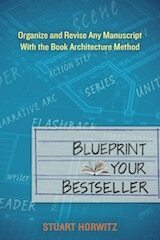 As though coming out of a fog, I take a few bold steps toward the bookcase in my upstairs study and reach for Blueprint Your Bestseller: Organize and Revise Any Manuscript with the Book Architecture Method by Stuart Horwitz. This and his two subsequent books lay out a brilliant method. I begin at the beginning, proceed through the steps, and everything gets better. It is important to have already written down everything I can think of to say on the particular subject at hand. That’s actually the first step. The method is most helpful to me once I have written a great quantity of words and am stuck trying to figure out how to help the project hang together. One step that is particularly useful is writing down all the scenes I can remember. Trust me, I never want to do it, but it’s like peeling the tough skin off broccoli, it is so much more satisfying to eat if I’ll just take the time to do it. So, I write down the scenes, compare them with what I actually have, and notice what’s missing. Almost immediately, I have some hope about the possibilities for the piece I’m working on. 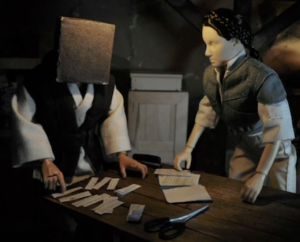 I print the manuscript out and cut up the scenes, worrying the whole time about how to save the brilliant segues I have written to connect various sections. Once this surgery is completed, I get the payoff: a sense of ease and spaciousness comes over me and I can see! Instead of one tight intransigent blob of words, they come to look like small interesting packets that have a chance of making sense together. The method works for a book, an article, or a chapter. I remember one particularly satisfying hour of writing when I printed out a slightly tangled chapter, cut it apart, rearranged and deleted, and found the meat. The next day I rewrote it. The method never lets me down. After separating all the scenes, I get to make charts on the wall of all the scenes and a big bullseye target that helps figure out what the theme is for the project. If I just stick with all the steps, I wind up with a much clearer, cleaner, more accessible piece and I stop feeling like I’m lost in the dark. Writing is hard, but it doesn’t have to feel aimless. Stuart Horwitz’s method will help you find your way. 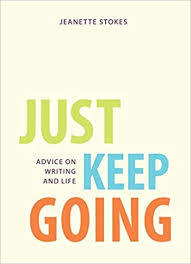 Jeanette Stokes, is the executive director of RCWMS and author of several books, including Just Keep Going: Advice on Writing and Life. She lives in Durham, NC.